Day one? Do I even need to say it? The control of characters felt noticeably different, speedier perhaps, and without the weight of characters in Dark Souls. Potentially worrying? Maybe, maybe not. I'm eager to see more impressions. I never played Demon's Souls but from videos that I've seen Dark Souls II kind of looks more like it in that things seem a little less weighty and enemies are easier to stagger. (Although I've heard some people say that Demon's Souls was actually the slower game so what do I know). One of the things I like about Dark Souls is the weight of the combat, it's a sharp contrast compared to all the other fancifully animated 3rd person button mashers out there. 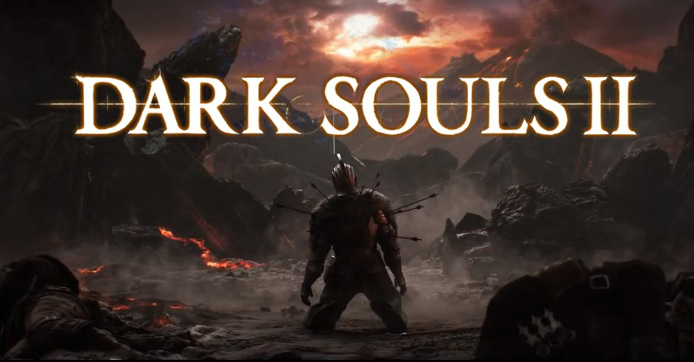 However I'm sure it'll still be more similar Dark Souls than anything else. Although that big flashy effect when they hit an enemy with an arrow looks a little silly to me. One of the interesting changes I've seen mentioned is that backstabs seem to have an effective range depending on what weapon you're wielding and that each weapon is supposed to have its own backstab animation. This video shows some of the pre-built characters they had for the E3 demo. They confirm that they've added more support to dual wielding weapons. Also it looks like pyromancies have been moved to sorcery so it may not be as easy to splash in some magic in your build. The spider enemy looks particularly interesting from a lore standpoint. It reminds me of the egg carriers you find in Queelag's Domain. No doubt. I don't day one as much these days, and I kind of feel like I got burned by Bioshock Infinite, but this and SR4 are day one for me, no question. Polygon has some details on their demo experiences here. Things are sounding pretty positive, which is very reassuring, despite the fact that this is an automatic day one purchase for me. The weapon-specific backstab manuever stuff sounds exactly like the sort of detailed refinement of existing systems that I want. Here's hoping that the bigger budget keeps feeding stuff such as that. I love the cloth on all of the armor sets, it makes it feel more like a roving wanderer instead of a guy in a suit of armor. The dual sword attack style looks a lot more interesting. It might even be a first try character for me this time around. As a huge fan of this series and the weighty combat the changes they're making seem to move away from what I want. Shame. On balance it looks like they've added melee based magic attacks so a pure caster might be more feasible than it was in Dark Souls. I don't really see that - the temple knight's halberd looks slower than the Dark Souls version if anything. The animation is certainly more fluid overall - it looks like both the frame rate and the refinement of the animation is better but I don't see a significant decrease in the actual time an animation takes. It doesn't look like you can cancel out of attacks or anything like that. Since it's not finished and the combat already sounds like it's gaining complexity rather than losing it? Yes, I'd say so. From what I've gathered, the demo doesn't allow you to peek at stats, so it's impossible to really make any determination as to how things like encumbrance and item properties and such are really working. This means that the folks at E3 are relying on raw perception alone to interpret how things are working. I bet there's at least some caffeine and severe exhaustion involved on their part, and if the animations are quite a bit smoother...well, there's several possible explanations for the change in "weightiness" for you. Yeah, I think it looks like improvements in the combat to me. This will be one of those rare games that I pre-order with release date delivery. This'll definitely be a pre-order for me as well, despite already knowing how limited my available game playing time will be when it comes out. They confirm that they've added more support to dual wielding weapons. Also it looks like pyromancies have been moved to sorcery so it may not be as easy to splash in some magic in your build. I'm very interested in seeing how the new dual weilding setup works out. I almost always play with a shield in Demons and Dark Souls no matter what build I use (you can have my shield when you pry it from my cold, dead ha-- oh, I died again; here you go! ), and would welcome being enticed away from that with enhanced dual weilding options. That's interesting that they decided to move pyromancy back into sorcery (a la Demons Souls). I really did like the stat-independent support magic capability that pyromancy provided for my melee build in Dark Souls. Also very curious about the dual wielding stuff. I think it could make Dex builds (which I assume is what it will scale in some way off of) much more interesting. Play Dark Souls shieldless. It really makes the game very different in how you approach nearly every encounter. I'm using a Demon Greataxe +15 in it and have had huge highs and lows just like my first time through. My excitement is barely contained. It is only mitigated by the amount of time still left for the game's release. I'm sure that, despite the characters apparently feeling somewhat faster, the devs have made up for that in some other, challenging way. Perhaps tougher enemies? Could also be the encumbrance isn't implemented yet, it's still a ways out. I hope that they don't make fast roll the definitive fast roll though, even if it makes heavy armor characters harder to play. The only reason I would consider PC is to be able to play with GWJers. Anybody have any thoughts? I'll probably be going with PS3 this time around (got DkS on 360). See, I am going to get a PS4 pretty much for sure. I don't know when I am going to upgrade my PC, and I think it needs it to perform well with current gen games. I may have to double dip, but I'll definitely at least get the PC version. I should have a PS4 by the time this comes out, so I might go that route. I suppose it depends on if there is any coop option with friends. Do we know about that yet? If not, I'll just stick with the PC version probably. Glad it's not coming out until March of next year because that'll give me time to finish DS and DeS. I would like to be a part of this game from the start. That always helps me with games for whatever reason. I also should clarify, I know DkS2 is for current gen systems, but PS4 hopefully will be able to play the PS3 games. There will be no backwards compatibility that I know of. The cell was a completely different architecture. The PS3 backwards compatibility will be over Gaikai, which will be digital copies. Yeah, I really hope they announce next gen before launch, it sort of seems silly not to. I guess I would probably get it on PC instead of PS3 if they don't but I would much rather have it on my PS4. It won't but I'm pretty sure Dark Souls 2 will be for the next gen systems too. I'm not really sure what question you are asking any more though. Obviously the next gen systems won't have the crowds that the current gen ones & PC will. I didn't realize that DS2 is just for PS3, 360, and PC at the moment. I probably caused some confusion there. Sorry! Yeah, PC all the way. I can't imagine them mucking up the PC release worse than they did with Dark Souls, especially after they claimed they won't. Someone will fix it at any rate. Somehow you guys all missed that it's going to be on next-gen hardware? They announced that up front.